Cart Viper Release 1.4.1 Available Now! After a busy couple of months development we are pleased to have released a new version of Cart Viper today. Version 1.4.1 comes with a host of new features and bug fixes, the major points are listed below. We’ll be blogging about the new features in the next few days, so stayed tuned find out more. Existing customers can download the latest version and upgrade by following the instructions in the PDF user manual. 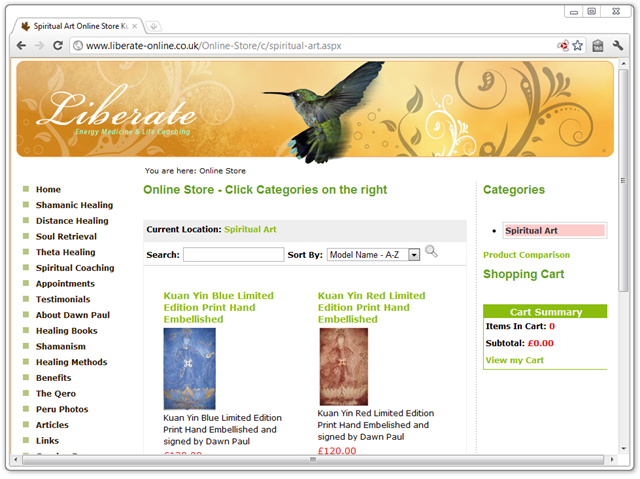 Getting feedback and reviews for our online store module is great, WSI Captivating Web Solutions have created an online store for Liberate a Shamanic Healing and Theta Healing practitioner in Hertfordshire. 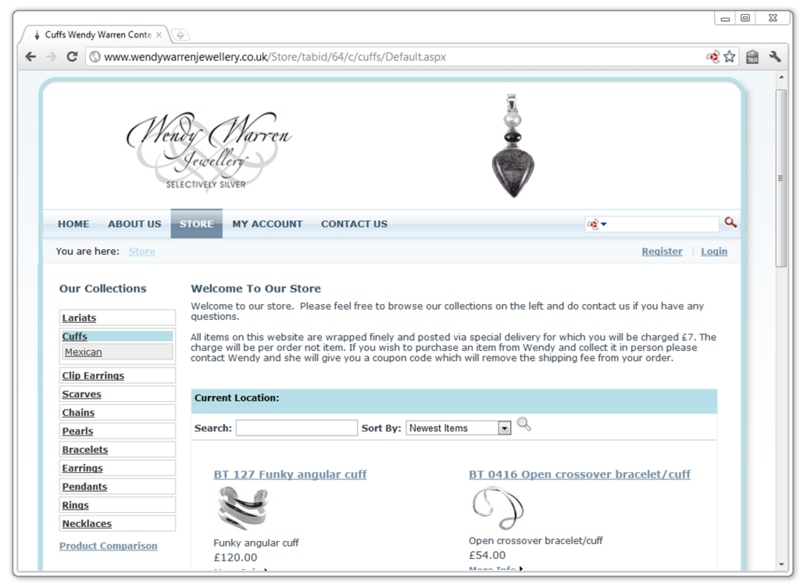 Its always great to hear from our clients, recently Sharon Ensbury from WSI Captivating Web Solutions created the ecommerce store Wendy Warren Jewellery using Cart Viper. Here is what Sharon has to say about the experience. Here at Cart Viper the DNN shopping cart we are putting the finishes touches to version 1.4.1 and hope to complete our final testing and do a general release by the end of September 2011. This new version is packed full of new features and improvements. Variant Images – Now you can define a different image for each variant combination, for example a different image for a red, blue or green t-shirt. When the user selects that variant combination the image will be displayed to them. Moderate Offline Orders – optionally choose that offline orders require moderation before being accepted by the store, allows store admin to add, remove and update items in an order. Mini-Cart Template Driven – alter the “Mini Cart” module to use the advanced templating system of Cart Viper allowing you to easily alter the look and feel of the mini cart. 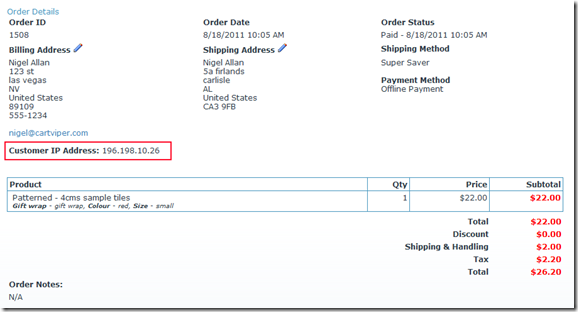 Qty Discounts – allow the store admin to define discounts based on the number of items the user is purchasing. Supplier Management – allows suppliers to be entered into Cart Viper and then optionally assign each product to a supplier. There are many more features and improvements in version 1.4.1, to view the full list of features and to view what we have planned for release 1.5 please checkout our roadmap. If you have any feature requests please let us know and we would be happy to discuss them with you. 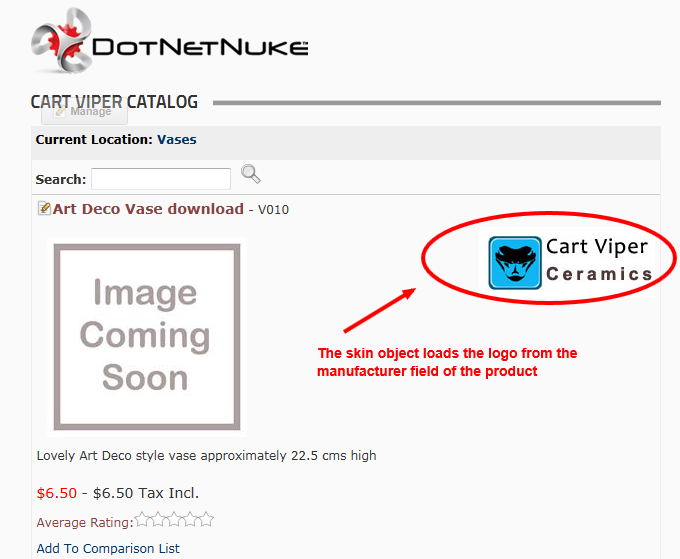 A further new feature added to Cart Viper the DotNetNuke shopping cart is the ability for the user to pay for items in your store with prepaid credit. 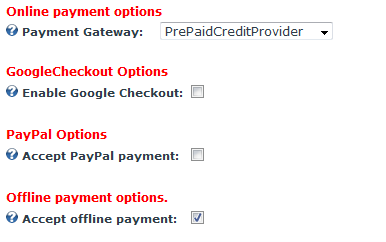 This checkout option can be selected alongside any combination of Paypal standard, Google Checkout or offline payment method. 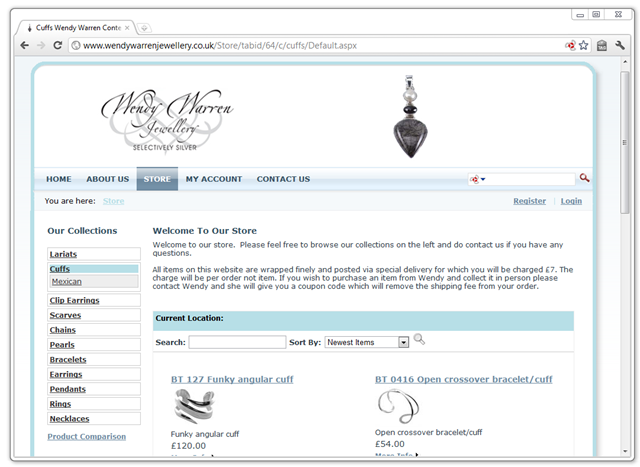 Giving your customers multiple options on how they would like to purchase their goods. 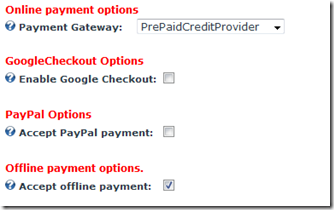 The prepaid credits feature was developed based on a customization request from one of our customers, if you have any features you would like to see added to Cart Viper please let us know. Previously when an anonymous user attempted to checkout with a digital download in their cart they would be redirected to the login screen. Now in version 1.4.0 anonymous users can now checkout and download their products without having to register/login into your DNN site. This feature should reduce the chance of users abandoning their carts during the checkout process if they are unwilling to share their details with your site. If you have any feature requests for Cart Viper please contact us. Part 1 of of using skin object in Cart Viper focused on using an existing skin objects to add content to the templates used in our module. 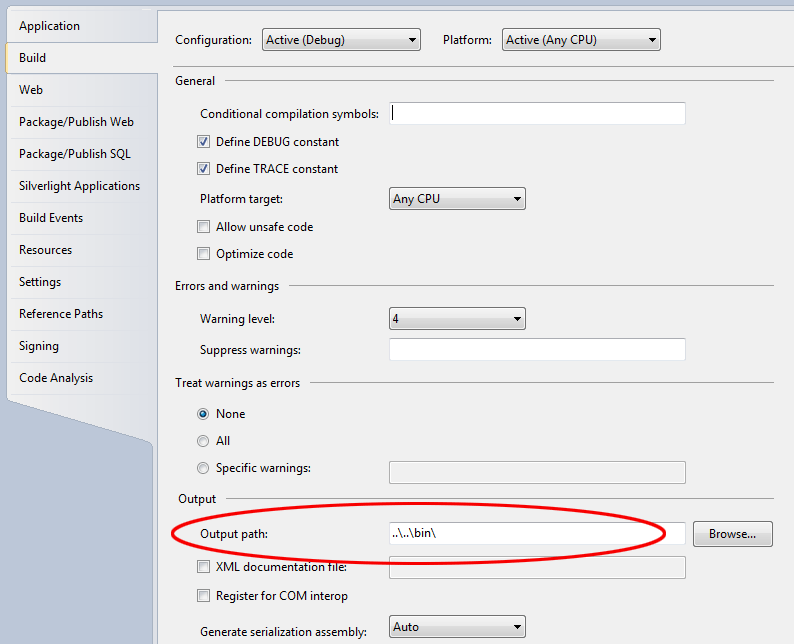 This part will focus on how to create custom skin objects to manipulate the product and category objects in Cart Viper. Since release 1.4.0 we have add the ability for you to customise the output of the store using skin object, today I want to show you an advanced feature that lets you write custom code in .net to create skin objects which you can use in the store templates. Lets take an example, I’ve got my store all setup but really want to display the logo for the manufacturer of each product. 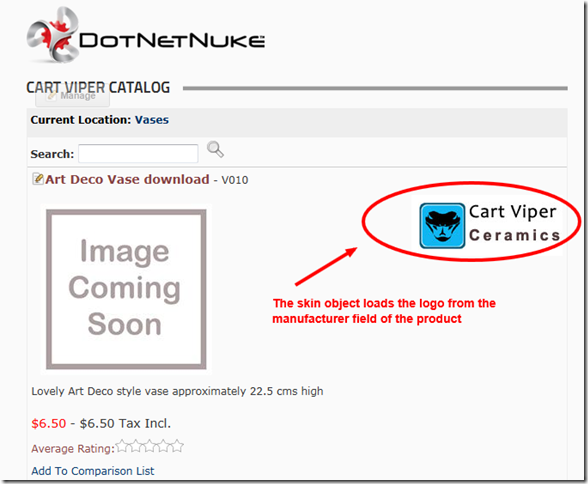 Cart Viper has no way to do this, however creating a custom skin object we can read the manufacturer value for the product and output a logo with ease. Lets take a walk through creating the skin object to see how it works. First I’ve uploaded my logos into a folder I’ve created in my portal home directory. I’m going to have my skin object display these on the product details page. Next I’m going to create a new project in Visual Studio, I just need a Web Application Project, its important that we create this with in the DesktopModules folder. Notice that we don’t need to check “Create directory for solution”. 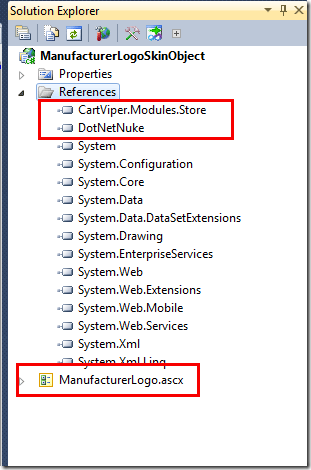 In order to create a skin object we need to inherit from a base class in DotNetNuke plus we want to use an interface from Cart Viper to allow the skin object to get Product object. So we need to add two references to files located in the /bin folder of the portal. When first creating the project Visual Studio will create some default folders and files which we don’t need so I’ve deleted those and added a single web User Control called ManfacturerLogo.ascx. 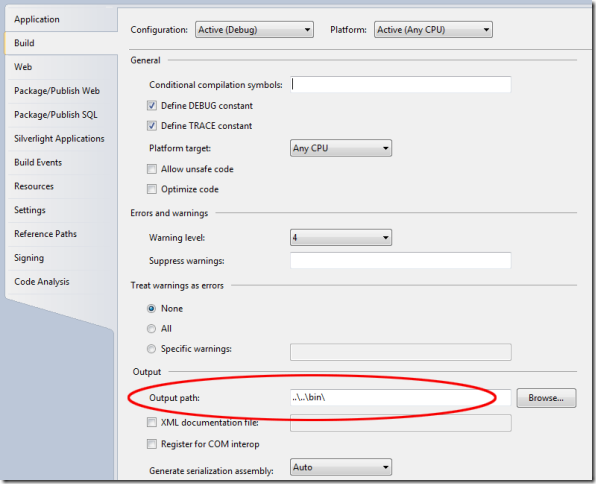 An important setting you need to make is to have the build output directly into the /bin folder of the portal. Lets take a look at the code in the ascx file, I’ve just got an image control which will output the logo for the manufacturer. Looking at the code behind file shows how the skin object works. Looking at the code the important parts to notice the class inheritance, we need to use SkinObjectBase which is located in the DotNetNuke.UI.Skins as the base class. We are also implementing the interface CartViper.Modules.Store.Components.SkinObject.ICartViperSkinObject this interface allows the template engine in Cart Viper the ability to set the properties Category and Product with the current product data. Note its only in the following templates that the ICartViperSkinObject properties will be set by the template engine. 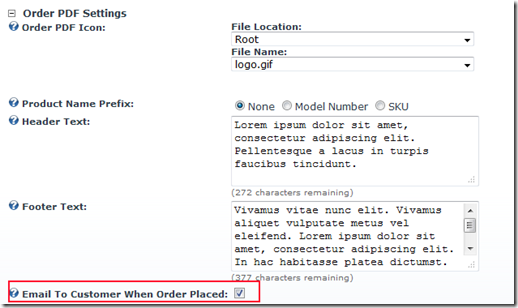 In other templates the Category and Product properties will not be set and will be null. The main work is completed in the Page_Load method, we check to see if we have Product object and then if the product has a value for the manufacturer property. We then remove all spaces from the manufacturer value and load that as the image source. 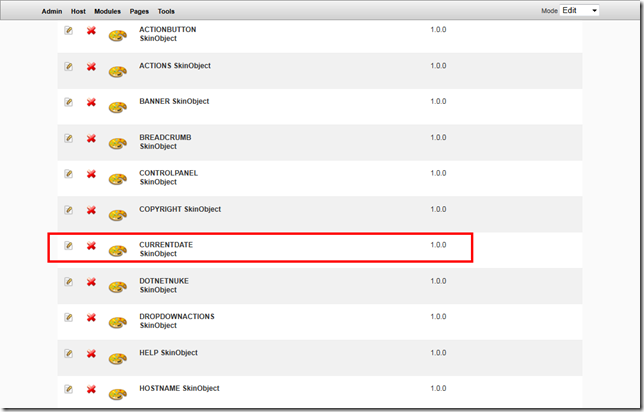 To use the module in DotNetNuke we need to have a DNN file to install the skin object. Then finally we just add the skin object into our ProductDetail.htm to get the manufacturer logo into the product details page. Using skin objects is a great way to customise Cart Viper, its lets you inject your own code and UI controls into the templates. 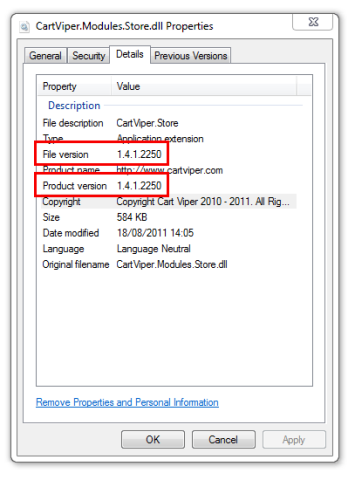 Using this feature will let you tailor Cart Viper to your requirements with ease. Since the first release of Cart Viper our DotNetNuke store we have supported a template based design and layout within our module. 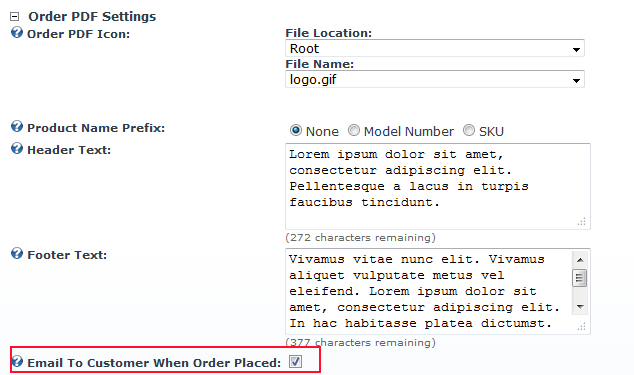 This allows the module to fit perfectly within a site simply by customising some XHTML files. Within the template files we have tokens which are replaced with data by the template engine when viewing the the store in a browser. With the release of 1.4.0 we’ve taken this a step further and now allow you to insert skin objects into a template. 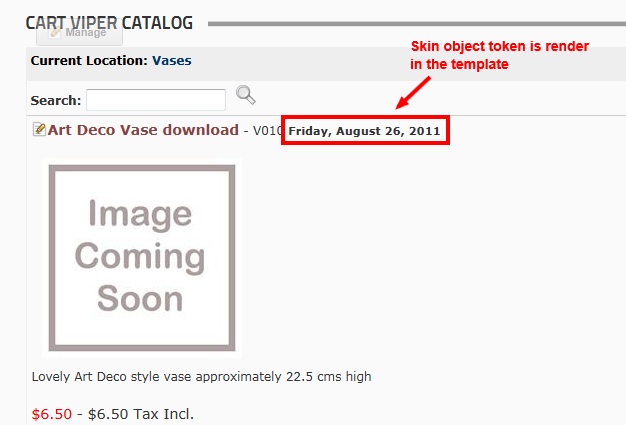 The skin object will then be rendered into the template when browsing the store just like how we replace tokens. 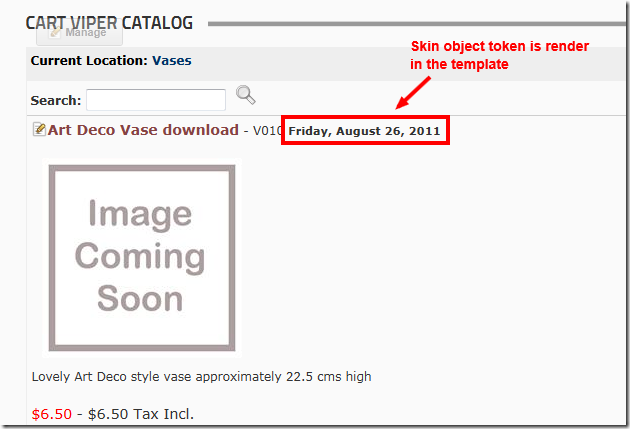 An existing skin object which comes as standard with DNN is the CURRENTDATE skin object, this when added to a template will output the current date. As a very simple demo I’m going to modify the Product Detail (ProductDetail.htm) template to output this skin object after the model number at the top of the page. To inject a skin object into a template we use [SKINOBJECT:NAME] where name is the skin object name, in this case CURRENTDATE. 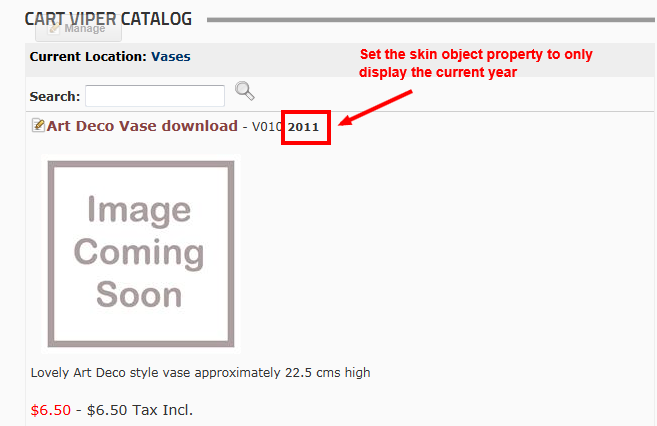 When we then view the product details page you can see we’ve added the current date to the template. 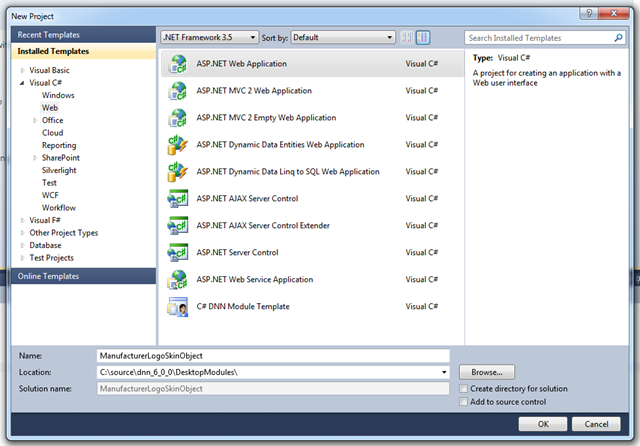 Skin objects are regular ASP.Net objects so they can contain properties, using our template we can set values for the properties using this syntax. 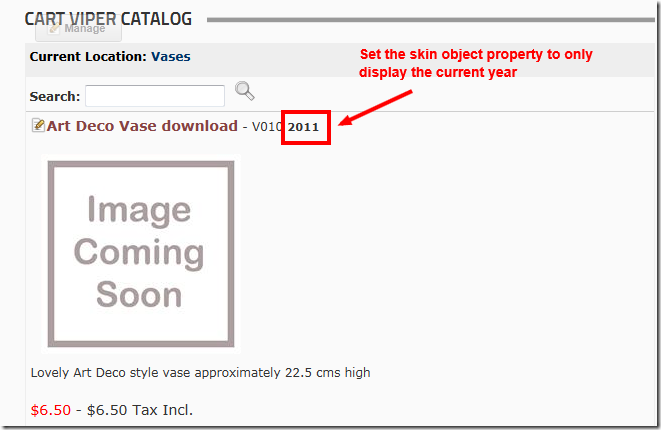 So we could set the property DateFormat on the CURRENTDATE skin object to allow us to just display the year. Here is our template with the property set. The output now simply shows the current year. The ability to add skin objects into your templates opens up the range of possibilities and ideas you can now implement. We aren’t finished there we have one more Skin Object trick which you can use to make great ecommerce sites, take a look at Using Skin Objects in Cart Viper – Part 2 to see how you can extend Cart Viper using templates. We have recently updated our NAnt build script used to build Cart Viper to include the revision number from Subversion. So now when we build the project it will update all the build numbers of the DLLs to have a revision number equal to the revision number from Subversion. In the example above the major, minor and build numbers come from a property we define in the NAnt script, so we just need to change this to increment all the DLLs to the new number. The revision number of 2250 is the revision number from Subversion, so in the future we now that this DLL was compiled using revision 2250 of our code base. This is automatically read from Subversion using the script below. Note we use TortoiseSVN so we are using a binary from that program to get the revision number. First we need to commit a special text file to the Subversion repo, this file contains a token which when we output the file from the repo will be replaced with the latest SVN revision number. For our build process we have a sub folder off the root of the project called build which contains the NAnt script and the revision file. In the NAnt build script we have the init target which handles updating the build number. The part that does the work is the exec element, this calls the subwcrev command line tool to output the rev.txt file to a file called revvalue.txt. This will have the effect of replacing the token with the reversion number. 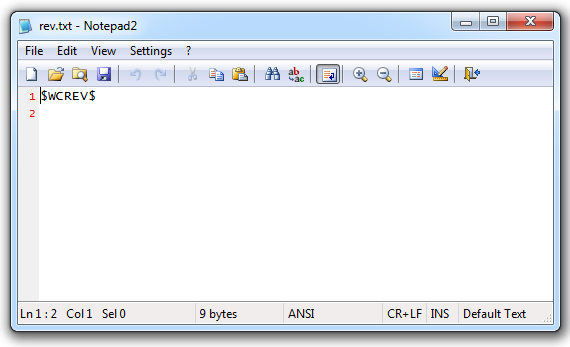 Now we need to read the contents of the file into a property in NAnt. The final thing we need to do is take the version numbers we have and replace these in all the AssemblyInfo.cs files in our project. To do this we need to use some custom code in the script. Remember we have our build file in a sub folder off the root of the main project file. So we need to move up one level, you may need to change this in relation to the location of the NAnt build file and the project root (see line 12). 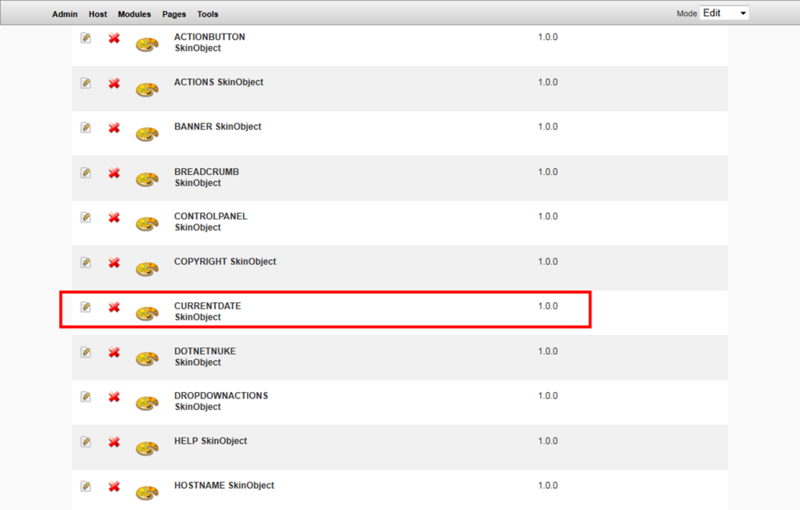 Now when you build the script the build numbers will be updated automatically. 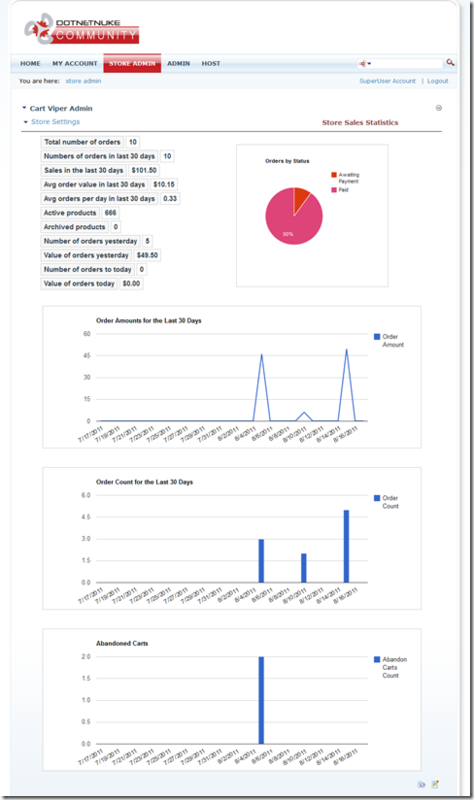 Running an online shop means you need to be able monitor your store and see how well it performing, in previous versions of Cart Viper we had the Sales Stats page within the Store Admin. 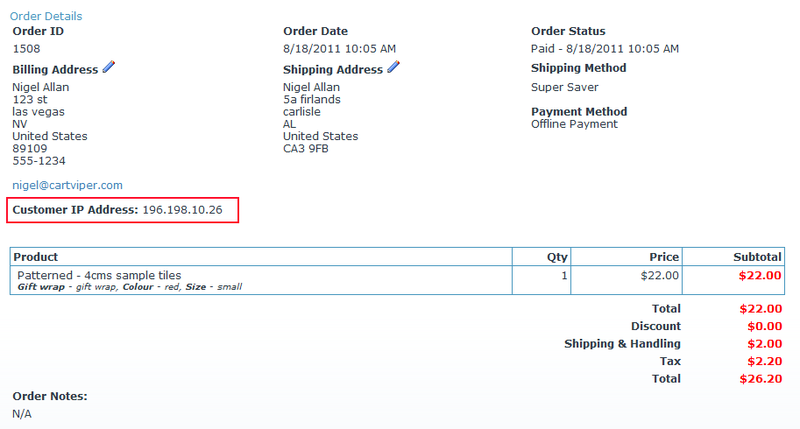 This page displays information about your sales, we’ve improved this in Cart Viper 1.4.0 to be even better. More graphs for at a glance performance indication. 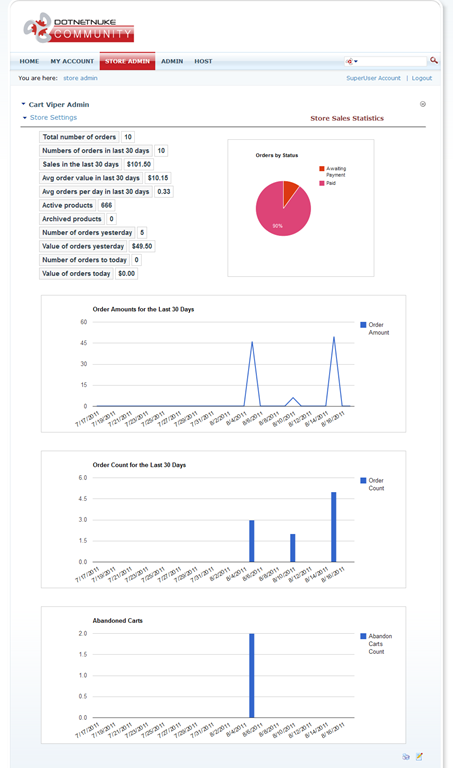 We’ve also included a graph which shows abandoned carts, these are carts which have been created but the customer never completed the checkout process. Rolling over the graphs then displays a popup.